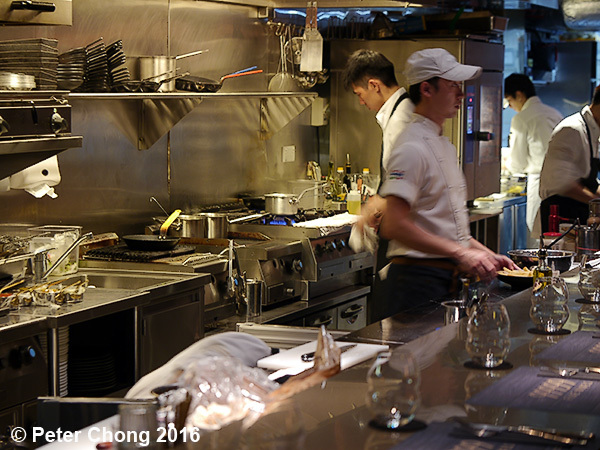 We report the best food and restaurants from Singapore and the rest of the world. Interesting name for a restaurant...999.99 (Five Nines)...the reason? The owners (Japanese) were gold traders, and the highest purity for gold is 999.99 (24ct gold). They have since retired from the gold business and started this restaurant. 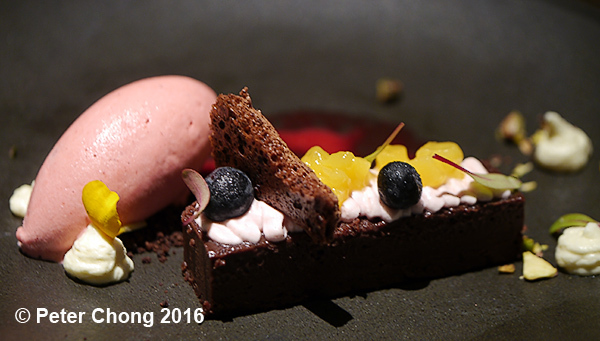 Headed by a Japanese Head Chef Masanao Saito, the restaurant served Japanese inspired modern European food. Seating is available at tables, as well as a bar counter overlooking the open kitchen. For the evening meal, we had A La Carte, and ordered the following...portions were shared by 2 pax. The burata was excellent. 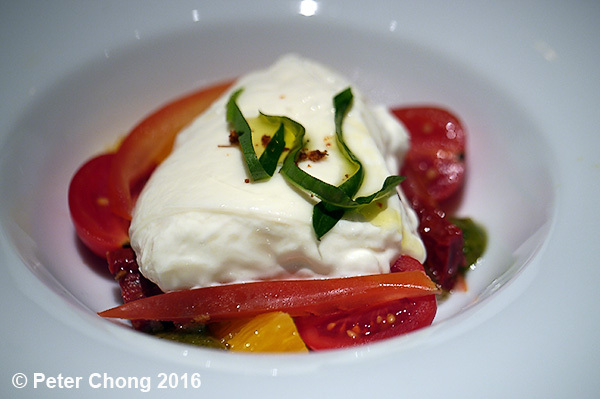 Mild as the fresh burrata often is, this Italian delicacy was complemented very well with the tomato salad. Nice dish. The seabass was very fresh, and lightly cured. A mild aroma of truffle lingers about the plate. 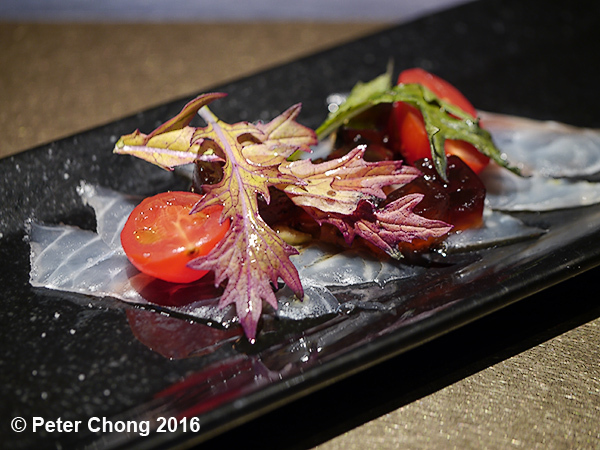 And the halved cherry tomatos were sweet with a tart aftertaste which went very well with the fish. 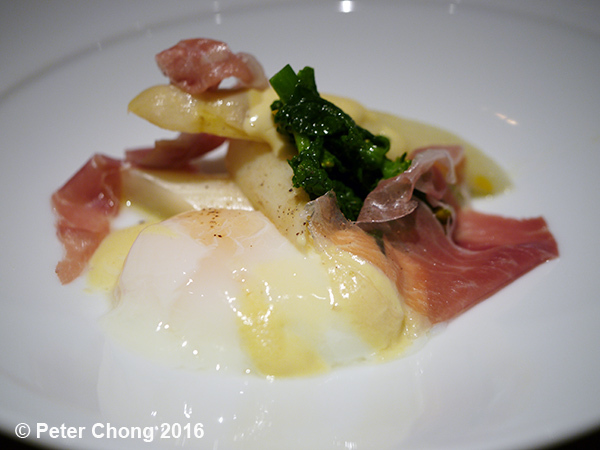 The sous vide egg was perfectly done, as it usually is. We found the white asparagus to be full flavored, if a bit on the fibrous side. But the slices of ham were the perfect foil to the egg. Nice one. A whole lobster, with the meat removed from the shell (yes, the claws were empty, the meat removed and used as filling with the cheese gratin. The first 20 servings for each day is offered at an incredible price of only $19. 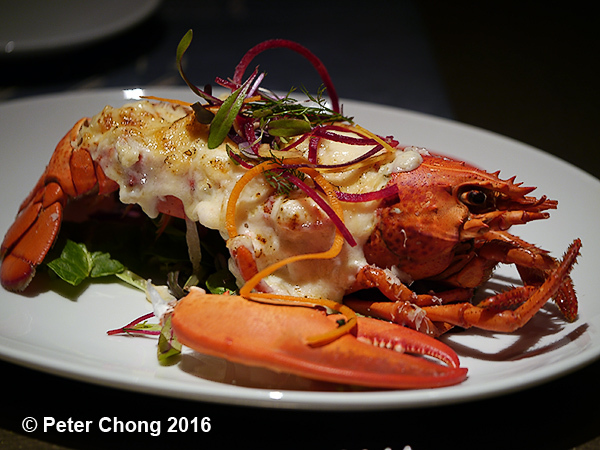 We found the lobster a little on the small side, but the taste more than made up for it. The lobster was probably live, and the meat was sweet, succulent and very tasty. Two chops were served covered by a glass bell filled with smoke. We were told the smoke was made from burning apple and cherry wood, and it was quite a spectacle as the waiter lifted the bell, and the wonderful smokey aroma filled the table vicinity. The meat was beautifully cooked. 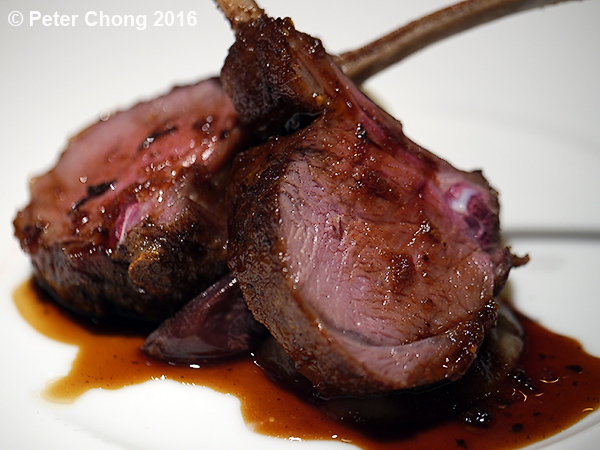 The lamb was well marinated, and did not have a gamey flavor, but one which is nicely aromatic with a smokey nose. The meat was tender, and not too fat, but still flavorful. This was my highlight dish for the evening. 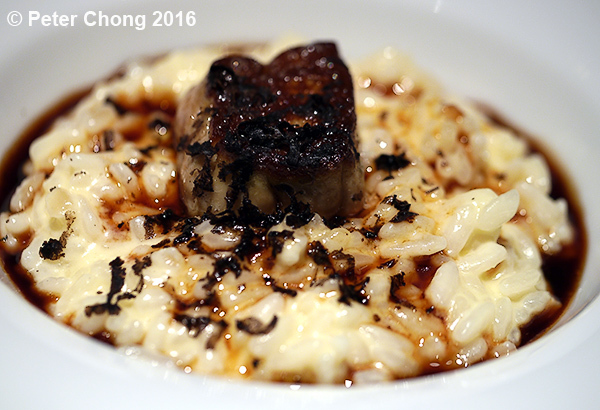 The risotto was a bit unusual. It was a little softer than expected, with the characteristic Italian al dente bite being mostly absent. And the truffle cream was light and did not get in the way. Nice touch by the chef to achieve this balance. The foie gras was excellent. It was cooked just right, probably pan fried till crisp on the outside, while still soft within. The fats bursting out as one presses it against the palate, exploding in a wonderful flavor that only foie gras can provide. Then the desserts. The Tiramisu ($8) first. Looks like almost every tiramisu in the world. But looks can be deceiving. The taste was wonderful. 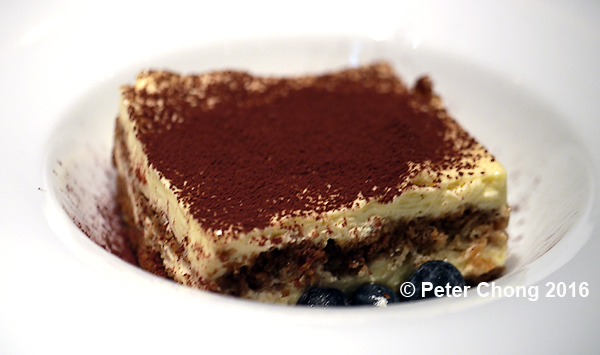 The texture was very light, with a good touch of cream from the mascarpone, and the alcohol. Very nice tiramisu. A small scoop of raspberry ice cream accompanies. The cake itself was a very dense chocolate and was excellent. A must have for the chocolate lover. The restaurant was nearly full when we were there for an early dinner on a Saturday evening. And although they do not enforce it, two seatings are generally observed. The restaurant opens at 6pm and the second seating is approximately 9pm. A nice restaurant, with good food at reasonable prices. If we had to nit pick, it would be that the servings tend to be a bit smaller than expected. Perhaps we were getting too used to American serving sizes...and perhaps its asking for a bit much as the prices were actually quite reasonable for food of this quality. While many blogs grant a Creative Commons License agreements, this blog does NOT. All content in this blog is protected as All Rights Reserved, unless otherwise stated. Although it is not mandatory to state this because this is guaranteed under the Berne Convention, it is hereby declared as a warning that all rights for all material in this pages are fully reserved.